It’s hard to argue with flour, butter and sugar, especially when they all show up to the same party. Here in Tahoe, where our high elevation requires bakers to blend a bit of extra art and science into their batter, we came up with these top spots to satisfy just about any indulgent sweet or savory craving, from extravagant wedding cakes to crusty artisan breads. “While you sleep, we loaf!” That’s the way this family-run European-style Tahoe City bakery rolls. Started by Swiss chef Peter Vogt and his wife Helen four decades ago, daughters Barbara, a culinary school grad, and Caroline, who studied restaurant management, together with longtimer JB Joynt, turn out loaves of breads like smoked garlic and asiago cheese, whole-grain ciabatta, focaccia, challah and Sierra supergrain. They are also known for savories like bacon cheddar scones with Black Forest ham and Gruyere croissants. On the sweet side, look for apricot and raspberry pockets, almond biscotti, Linzer cookies, nussgipfel, and cakes from chocolate truffle and sacher torte to cannoli cream. They also sell their own line of 32 sauces, dressings, seasoning rubs and jams, while the bakery includes fireplace and table seating areas. With her husband Brett, Allison Sayles, an alum of the New England Culinary Institute, Squaw’s Headwall Cafe and Fiamma’s, owns this snug takeaway spot tucked away on Tahoe City’s Lake Forest Road. 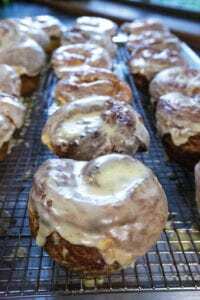 Customers come for orange morning buns, apple custard puff pastry, iced lemon poppy bread and chocolate beet bread, hot grilled croissants, and buttermilk biscuit sandwiches. They also sell sweet and savory order-ahead items like baked French toast, orange chiffon bundt cake, frittatas and quiche. Those with allergies, from grains to gluten, will find solace here. For some 35 years, skiers and riders have made the pilgrimage to this seasonal spot inside Squaw Valley’s Olympic House for one thing: chocolate chip cookies. Buttery, gooey, melty little rounds of joy. Julia Mancuso, Marco Sullivan and Travis Ganong are among the legions of fans that Susan Lopez has snagged with her recipe (Olympic gold medal winners get free cookies for life). Those in the know purchase an annual cookie pass to feed their addiction and head for the cookie express line when it’s open. Cinnamon buns, pizza bagels, sandwiches on Wildflour’s multi-grain bread, plus tacos and tamales, are also on the menu, all of which can be enjoyed at the communal wooden tables. Greg Buchheister kept growing his Coffeebar empire, and this subway-tiled spot on Truckee’s Donner Pass Road supplies his three area stores with freshly baked goodies daily—because, as their website proclaims, “Nobody likes a stale scone.” Look for seeded paleo pumpkin bread, blackberry scones, Nutella croissants or brioche cinnamon rolls and donut holes. Cakes and cupcakes like devil’s food, red velvet or caramel can be made to order, and there are lots of gluten-free options courtesy of Elizabeth Weir, whose Whole Treats formerly occupied the space. Of course, there’s also a full range of coffee drinks. Reno native Kristy Kirsch, who studied at the California Culinary Academy in San Francisco and honed her skills in Italy, and East Coaster Daniella Luchian—a CIA Hyde Park grad and alum of Gary Danko’s in San Francisco, the French Pastry School in Chicago, and Ritz-Carlton Orlando—opened this custom-order bakery in Truckee. From their Pioneer Trail location, they work on everything from wedding cakes to cupcakes. Every Friday they roll up their bakery door and sell seasonal breads, pastries and desserts from 8 a.m. to 2 p.m.
Cinnamon rolls assembled from flaky croissant dough, topped with a cinnamon smear and cream cheese icing, are the ticket at this little Lake Tahoe Boulevard spot across from Bijou Shopping Center. Owners Angel and Gloria Sosa bake a rotating lineup of breads that includes 9-grain, challah, jalapeño cheddar, Kalamata olive, ciabatta, Swedish limpa rye and Tahoe sourdough. Look for custom cakes like tres leches, brownies, cheesecake, black and white, cappuccino and rocky road varieties, and tarts like key lime, bread pudding and lemon meringue. 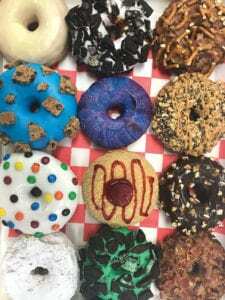 Mara and Anthony Cavallaro named their gourmet donut destination at Tahoe Beach Retreat after the movie Dazed and Confused, which is how you may feel after working through their sweet slate of treats. The Pretzel Body Logic layers maple icing topped with crumbled bacon and pretzel pieces. Don’t Lay A Finger does chocolate icing with Butterfinger pieces and warm peanut butter drizzle. Blueberry French Toast brings maple icing, toasted cinnamon cereal and a dollop of blueberry pie filling. Located adjacent to the gondola at Heavenly Village, this take-away stand serves specialty mini-donuts hot and fresh from the fryer. You can go plain powdered sugar and cinnamon, design your own or up the ante with one of their combos like the S’more with marshmallows, chocolate sauce and graham crackers, or the Raspberry Truffle with raspberry and white chocolate sauces and Oreo crumbles. They also sell freshly roasted nuts. 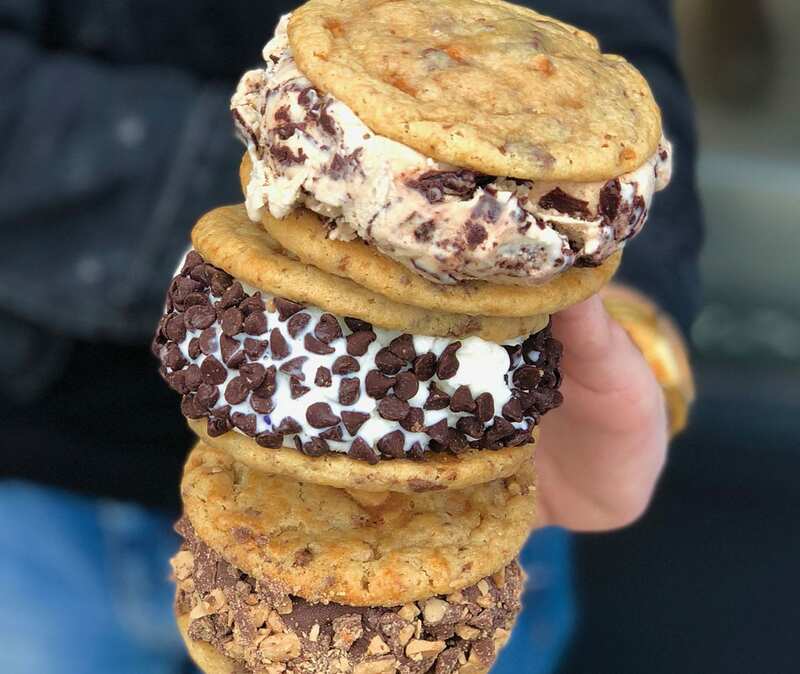 This San Diego–based custom ice cream sandwich shop at Heavenly Village comes from a pair of longtime SoCal pals. Pick a freshly baked cookie such as snickerdoodle, oatmeal cinnamon or chocolate chip, or perhaps a brownie, donut or waffle. Top it with a scoop of one of their 13 craft ice cream flavors, including strawberry cheesecake, salted caramel fudge or Bear Batter—bright blue ice cream made with cake batter, fudge and brownie bits. Top it with another cookie (mix and match if you like), roll the sandwich in toppings and even get it warmed up if you want. Longtime Tahoe resident Grace Schorr has baked cakes for over four decades, finally opening a storefront on Highway 50 near Lakeside Inn in 2007. 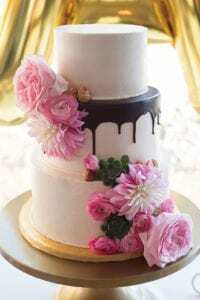 Daughter Elizabeth Gore joined the business of creating wedding and special-occasion cakes and cupcakes, cake truffles and cake pops, many of which are made using longtime family recipes. Caramel macchiato, maple bacon and tiramisu are but a few of the cake flavors and buttercream icing ranges from Baileys to peanut butter. Gluten and sugar-free options are available. Native San Franciscan and California Culinary Academy grad Sarah Lofgren’s bakery makes every wedding or specialty cake, cupcake, cookie and pastry to order. A long list of flavors range from champagne and confetti to almond poppy seed and red velvet. Fill it with chocolate, pumpkin or peanut butter mousse and ice it with amaretto, salted caramel or salted caramel buttercream, or chocolate ganache or fondant. There are also cake and pie pops, mason jar creme brulees, bourbon balls and more. A prolific baker for many years, Allison Vaccaro officially launched her custom cake business in 2016 with an emphasis on modern and artistic designs. Choose from one of her popular combinations like the Champagne Toast made with champagne cake, strawberry jam, vanilla cream and vanilla buttercream filling. Or create your own from flavors like chai or pumpkin spice cake, salted caramel, cinnamon, lavender or rose buttercream, and fillings from cookies and cream to apricot jam. 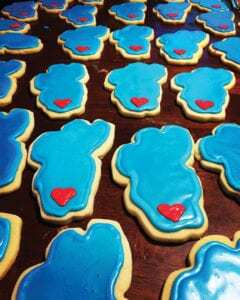 Desserts include colorful macaroons and cookies shaped and hued like Lake Tahoe. Formerly known as Witt’s Cakes, this baking biz is owned by Michelle Witt, who parlayed her degree in culinary arts into a position as pastry chef at Harrah’s Lake Tahoe, creating desserts for the property’s fine-dining restaurants. She now focuses on custom cakes in flavors such as mimosa, confetti and white cake with fresh raspberries that can be filled with buttercream from Bavarian to Madagascar vanilla.